Powder Metallurgy of Superalloys details the advancement of powder metallurgy in the context of producing superalloys. The book is comprised of nine chapters that cover the underlying principles of superalloys produced through powder metallurgy. The text first covers concerns in pre-alloyed dispersion-free powders, such as powder production and characterization; powder consolidation methods; and quality control and non-destructive evaluation of P/M superalloys. The next chapter talks about oxide-dispersion-strengthened superalloys. 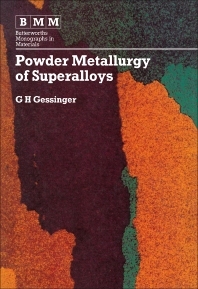 Next, the book discusses joining techniques for P/M superalloys and the practical applications of P/M superalloys. The title will be of great use to professionals in the materials manufacturing industry.